Doctor Who: The Adventure Games start off with a bang with City of the Daleks. The BBC has revealed new details on the series' first episode, which begins in a destroyed London and ends on the Dalek home world. 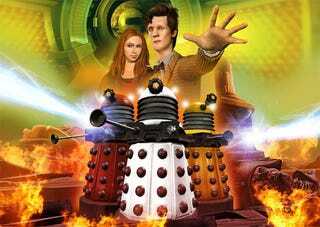 Written by Phil Ford, City of the Daleks does exactly what fans would expect from a video game, presenting the sort of larger, more lavish adventures that would cost a fortune to produce for a live action television show. The episode opens with London in ruins, the new Daleks introduced in last weekend's Victory of the Daleks in control of time itself, and the Doctor's companion Amy the last remaining human on the planet. From there the Doctor and Amy must travel to the Dalek home planet of Skaro in a last-ditch attempt to save the human race from extinction. Will they succeed? Of course they will. It's the getting there that's fun. And if you think that sounds exciting, the second episode features the Cybermen! Check out the link below for a preview of the free adventure games, as well as more information on the continuing series.